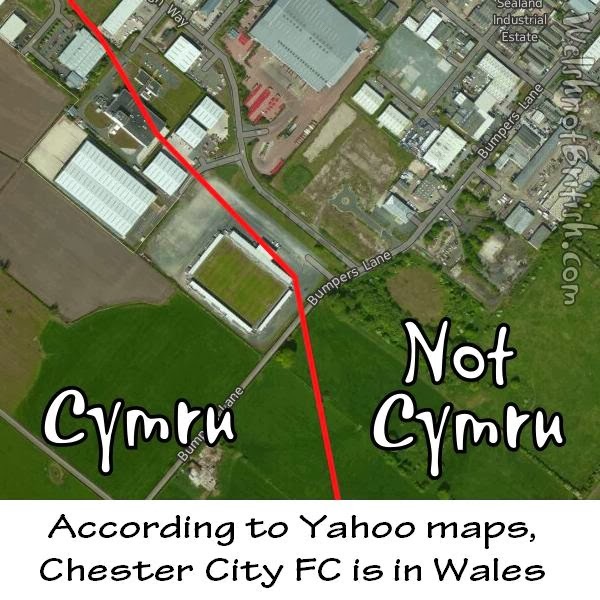 That's odd, according to Yahoo maps, Chester FC's ground is completely inside Wales. Now I know some people will rubbish yahoo maps, but I wanted to use a few different companies in case some were more accurate than others. 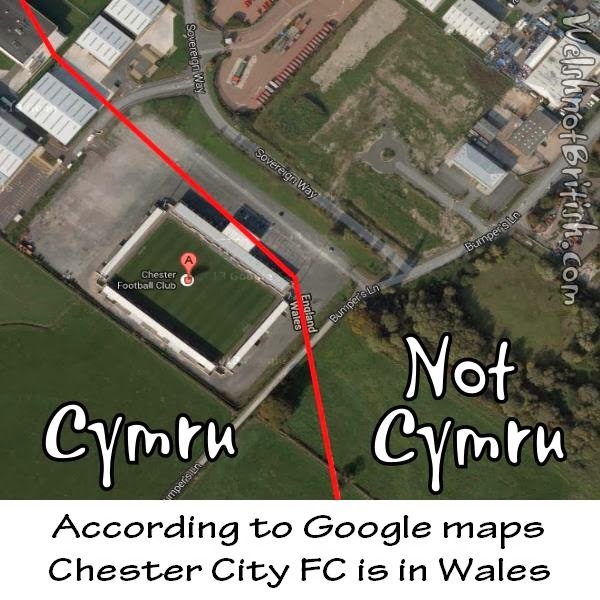 Now Google is telling us that Chester FC is completely in Wales. I think it's time to check out the Ordinance Survey maps and see what's really happening. Or rather, in order to bypass the need to install 3rd party software just for them to tell me I need to spend money to see the maps I'll just use the OS maps that the People's Collection of Wales provides for free. 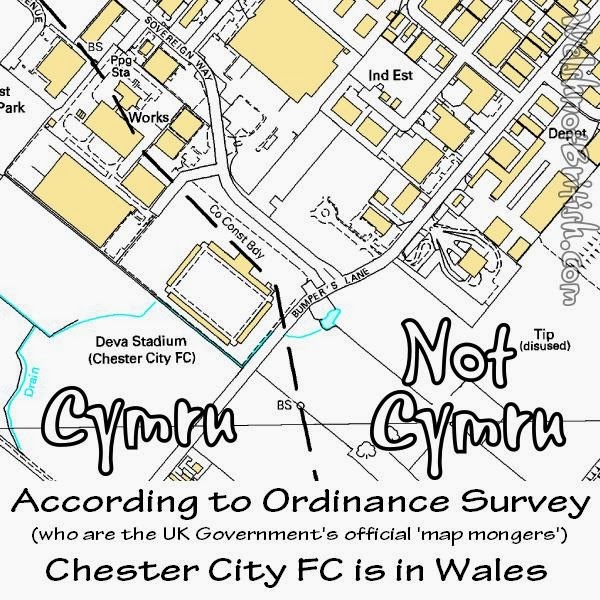 Now look at that, according to the Ordinance Survey, who are the official UK Government map 'mongers', Chester Town FC is in Wales. 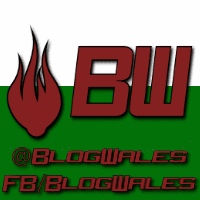 But let's also take a moment to appreciate the People's Collection of Wales map site as they also provide historical maps so you can see what used to be there. The maps go back 150 years so there always plenty to discover. 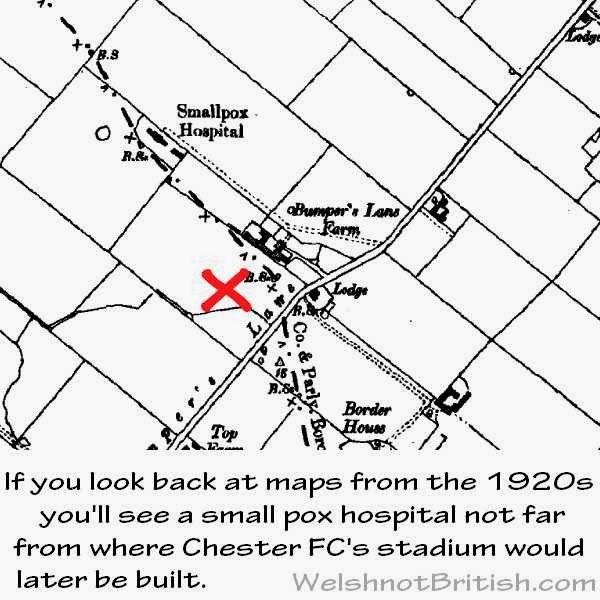 Naturally the stadium is new so it wont be on the old maps but when I wiki'd the stadium I was interested to read that the stadium is described as 'spanning the Wales–England border'. As we have seen above, this is complete nonsense. Perhaps you can only access it via England but the stadium itself is in Wales. Whilst writing this I remembered that I sent an email to Sports Wales last March, one of the questions I asked was if Chester FC received any funding from Sports Wales due to part of their stadium being in Wales. I had the following reply. "Thanks for your enquiry. I will need to consult colleagues before coming back with answers, but I will be in touch as soon as possible." They never replied and I forgot about it. I emailed them back this week, this time stating that the OS shows that their entire stadium is in Wales. This means that they are effectively a Welsh club so not only should they be eligible for any funding available but they should also be governed by the FAW, pay rates to the Welsh county council of Fflint or whatever it's called after the merger with Wrecsam. Edit 29/1/14 I have received a reply from Sports Wales confirming that to their knowledge Chester have received no funding from them. But they did add that if their stadium is in Wales (which it is) then they would be eligible.